For a number of years the charitable efforts of the Southern Commandery have included the provision of medical supplies for Samoa. These supplies have been collected by Dame Veronica Pyle, who has been most successful in finding the cheapest sources of supply, and sent to Sister Marietta Parsons, of the Society of Mary. On two occasions Sister Marietta was about to go out on her rounds, wondering how on earth she was going to manage as her supplies of bandages and dressings had run out, when a package arrived from the New Zealand Grand Priory of the Order with a good supply of the much-needed materials. In acknowledging with thanks the latest consignment, Sister Marietta pointed out that she is looking after six people who have ulcers either on their hands or on their feet, as well as others families who are in need of help. Two men were sent off to the Twomey Hospital in Fiji for prosthesis, one having had an amputation in hospital and the other surgery. Included in the latest consignment were some crepe bandages, and the patient who had had the amputation was particularly pleased to have these. Of those with ulcers three live very far inland, remote from hospitals, clinic and other medical help. Even for those who can travel to the clinic, the nurse is not always present. Sister Marietta’s visits with dressings and medicines to all those she is looking after, regardless of where they live, are therefore most important in ensuring the sufferers and their families are given the best possible treatment, and it is now abundantly clear that the supplies provided by the Southern Commandery are an important component of the effort to ensure the welfare of the sufferers from leprosy and their families. The material supplied by the Order has enabled Sr Marietta to treat the sufferers’ ulcers on a regular basis and, as a result, the ulcers are decreasing in size, and one lady, Monika, whose ulcers on her hands and feet have cleared is now in a “clear state” and the ulcer on the ankle of a male patient has almost gone. Not only are the visits of Sister Marietta important in enabling her to treat ulcers and other conditions on the spot, but also they enable her to train family members to look after the conditions between visits. Support from family members is vital as the sufferers themselves have no feeling in their extremities, and can be unaware of the damage an untreated ulcer can cause. 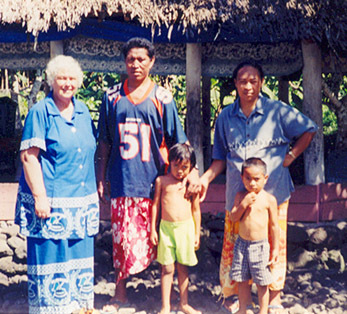 Va’a Nimo, who lives a long way inland and who, consequently would find it very difficult to visit the clinic at all, let alone on a daily basis, is, as a result of Sister Marietta’s visits, now very conscious of the need to treat regularly the ulcer on the sole of his foot, and his wife dresses it daily with dressings from the Order left by Sister Marietta. 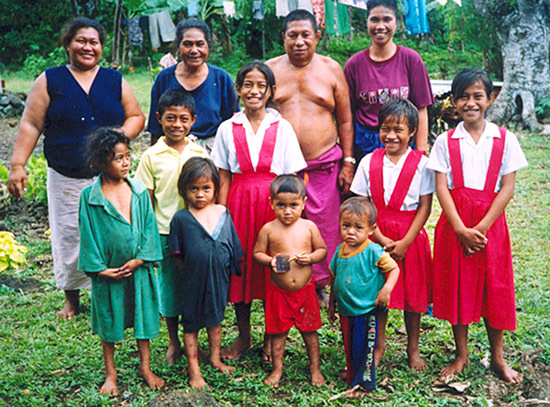 Both Va’a Nimo and Faletui, who also lives a long way from the main road, are well aware that the bandages and dressings that they are able to use were the gift of the Order from New Zealand, and their gratefulness for what is being done for them is more than ample reward for the members of the Southern Commandery who wholeheartedly endorse the continuation of this project.